With the "June Gloom" upon us, I and several colleagues gathered under overcast skies at Redwood Regional Park and the Chabot Space and Science Center to hear updates about recent and long-term East Bay redwoods research at the East Bay Regional Parks' "Symposium on the East Bay Redwoods of the Nineteenth Century." Experts also shared inspiring lore about our local giant trees that reminded us of what we’ve lost in the complete logging and population explosion of the Bay Area. Prior to 1840, the old growth redwoods of the East Bay stretched from Moraga -- west of the Oakland Hills -- and harbored grizzly bears and California condors. This wonderful article in Bay Nature Magazine gives a fuller account of the history of Redwood Regional Park and its trees. Now only two significant enclaves of old-growth redwoods remain in the greater Bay Area –- Muir Woods National Monument and Big Basin State Park -– and grizzly bears and condors are long gone. The current tallest tree in the world is a redwood in Humbolt County, which tops out at 379.1 feet. Historical records indicate that these redwoods may have been as old as 3,000 years, although Humbolt State University professor and researcher Steve Stillet has determined the oldest tree in Humbolt Redwoods State Park to be around 1,850-years old. Two of these taller trees, known as the Blossom Rock Navigation Trees, were important landmarks for ships entering the bay. 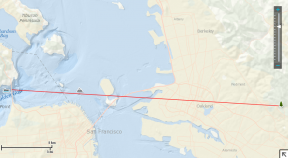 By lining up the north end of Yerba Buena (adjacent to current Treasure Island) and sighting on the two tallest trees, ships could avoid Blossom Rock which rested just below the surface of bay waters. Nearly as large as Alcatraz, Blossom Rock posed a significant hazard. Paul Miller, the EBRPD Recreation Area Unit Manager, shared his saga of using the 1850 Naval Survey of San Francisco Bay by Caldwalder Ringold to sail out on the bay to try and verify the current location of the Navigation Trees Historical Monument. Though the rock was initially blown up in 1870 and taken down to 25 feet, and lowered to 42 feet below mean water level in 1932, it still bears consideration for ships with larger drafts. Chart showing the Navigation Tree site lines in action to help ships avoid Blossom Rock. Graphic courtesy of Paul Miller. A straggler of the old growth is still present today and is known as the “Old Survivor” in Leona Heights; its historical marker is located at Carl B. Munck Elementary. Eric Folmer, former EBRPD staff and arborist, did some investigation into the tree. At a purported 350 years old, it’s not nearly as ancient as its hilltop relatives. The clones that sprouted from the root burls of these trees still carry on and tower along the ridgeline. Emily Burns from the Save the Redwoods League talked about the future of our forest, as we have the driest and eastern-most,isolated stand of redwoods in their range. 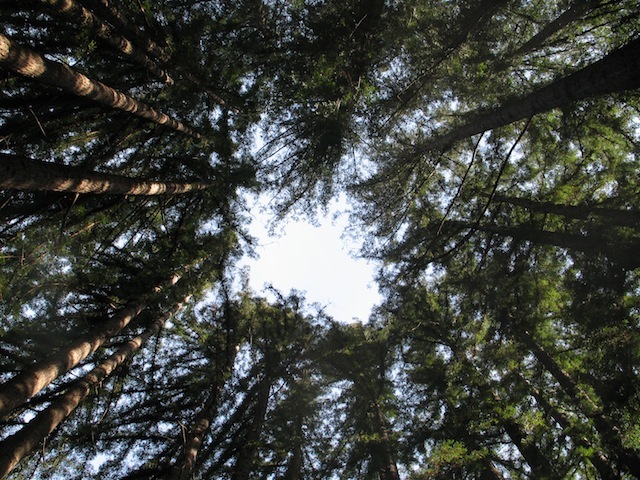 She noted that scientists are waiting to see how climate change might affect the redwoods. It may actually benefit our redwoods as long as they get enough water overall; sunnier days help bigger trees grow. If only we could stick around as long as the East Bay redwoods hopefully will, we might see our young forest flourish -- and in another 1,500 years, our descendants might have trees with a semblance of what once existed so near us.